Week 7: Vacation is over, How’d I do? Every year, we have a family vacation at Indian Lake and we are there for 10 days. This usually means 10 days of snacking, drinking and just having complete fun. Being positioned just over 30 days into my goal of getting fit (Project Tony Melt) was certainly a risky proposition. I am happy to say that I was able to stick to my plan. I had more free time to exercise without any time constraints. I tried to make fairly good decisions on food and snacks. I only missed my net calories (total consumed minus those burned off through focused exercise) one time and only by a couple of hundred calories. Plus, I took my scale with me to help ensure accountability. I didn’t lose a lot of weight on vacation, but I did get down 4 pounds over the past 11 days. I also started my blood pressure medicine and the impact was immediate. I am fully in the normal/ideal zone with no side effects. Score! As of this morning, I crossed the 25 pounds mark and have lost a total of 26 pounds since I started. I am under 300 pounds! That’s 8 percent of my body weight in just over 30 days! This is one of my biggest accomplishments in a very long time! I am very proud of this accomplishment and shared it on Facebook. This is really the first time I have gone that public with my fitness project. Though I have mentioned some things here and there and people have been telling me that my selfies show I am losing a bunch of weight. I got a total of 91 likes, the most I ever received, and a ton of supportive comments. Speaking of supportive comments, I am starting to get lots of positive feedback from people who know me because I am starting to look like I am losing weight. This is so notable that one of my coworkers reached out and told me that another coworker texted her to check on me because I look like I lost a lot of weight. My shin splints seem to be 100% healed now so I am back on top of exercise. Plus I am being pretty consistent with my calorie intake being lower than what I burn. I have ended up getting a prescription for blood pressure medication, but a very low dose and hopefully just temporary. Plus, the x-ray of my knee showed no structural problems. So, it is likely just a matter of overuse… I hope! 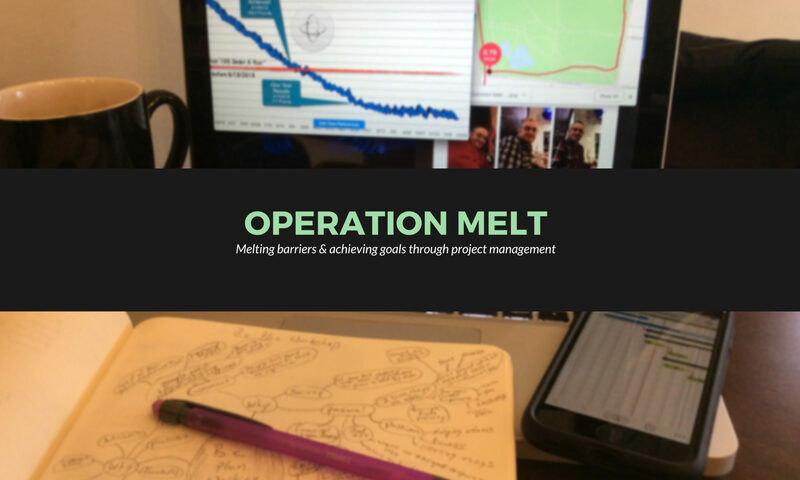 On a fun note, I have giving my fitness project a new name when talking to people about it: Operation Tony Melt. One other note, I have started adding stats to each of my posts to give a glimpse to my results. These results are delayed for one week so that I can count the full 7 days. Through the past weekend, I stepped up my exercise and woke up Monday morning (long 4-day holiday weekend) with severe pain in my left shin. After researching and discussing with a couple of athletic type people, I learned that I had shin splints. They were so bad on Monday, Tuesday and Wednesday mornings that I didn’t exercise at all and that was frustrating. I finally started getting back to walking, albeit very slowly, on Thursday morning. The cause of my shin splints was most likely related to ramping up stress on the shin without proper footwear. So, I went to a running shoes store (Frontrunner) and had my foot measured, arches evaluated and a gait analysis. I invested in some higher end Asics shoes and carbon fiber insoles to help prevent further injuries. They were expensive, but a good investment. My target calorie intake decreased this week as my weight decreased. I did a good job sticking to the calories and didn’t miss even once, though I was close. My bigger challenge was that I accidentally consumed less than 1000 calories on Thursday. This is a very unhealthy caloric intake and I even ate ice cream at the end of the day to put myself over the 1000 mark. My weight throughout the week as up and down. But, by the end of the week, I was down to 306 pounds, so I am approaching the milestone of getting under 300 pounds. Plus, my heart health range has moved up a bit and I am in the “Poor to Fair” territory. My blood pressure is still a big concern and my follow up appointment is next week. Ending my second week with my new get-healthy plan. Lots more successes this week, but a few issues have developed too. First off, I ended the week at the 308.8 pound mark as of Friday morning – I didn’t weigh myself during the weekend because we were at the lake and I chose not to take my scale. During the long lake week at the end of July, I will plan to take the scale with me. But, I have already lost 16 pounds! Next, my knee pain has been pretty impactful this week. It hasn’t stopped me from exercising, but it has certainly slowed me down and made it less enjoyable. I did go and get the knee x-ray this week so that will hopefully help identify the source of the pain. Though, my doctor’s initial diagnosis is that it is just the added stress from exercise and it will get better as weight loss continues. My biggest concern this week has been my blood pressure. My smart blood pressure cuff arrived so I have been monitoring where I sit. The results haven’t been good. In fact, some of the measurements (bottom number) have been nearing the “Call 911” level when I search online. So, I am pretty sure that blood pressure medication is in my near future. On the topic of gadgets, I bought a Fitbit this week too. So, now I can really measure exercise, heart rate, sleep and such. One of the first things I discovered is that my heart health is in the “Poor” range in the app. That doesn’t make me feel good. Plus, resting heart rate is a new measurement in my repertoire for tracking. The big gain here is that I can monitor resting and active calories burned and really get a feel for whether I am burning more than I am consuming. From a diet and exercise perspective, I was under my target calories every day and managed alcohol consumption. I exercised pretty much every day and really stepped in up during the weekend. I did a 3 mile walk at around 16 minutes per mile. I also sat down with my boss and explained the health journey I am going through. I talked to her about reducing my hours and controlling stress. She was overall supportive about everything and talked about the good opportunity it presented for my team to elevate themselves as I work fewer hours. Today is the day, my return visit to the doctor to get the results of my blood work. I was very nervous going in for my first visit and way more nervous going in this time. Am I going to be showing signs of diabetes, is there anything else I don’t know? Plus, my appointment is right in the middle of the afternoon before my PMO team meeting, so I need to get there and back quickly. First 2 things that weren’t good in the appointment were weight & blood pressure. When the nurse asked me to step on the scale, my impressive weight loss wasn’t as impressive. It was the afternoon, 2 meals consumed, lots of fluids and fully dressed unlike the morning. Still lost weight, but only 5 pounds and not as much as I saw in the morning. Oh well, I know I am doing well. Then, my blood pressure was pretty elevated when the nurse took it. I assumed this was just stress about my results so I didn’t think too much about it. Then, the doctor came in and shared my results. So, the good news first, nothing is bad, nothing super-negative and nothing to be overly concerned about. However, there are some things that I need to work on. I had some elevated liver enzymes, nothing horrible, but need to work on through reduced alcohol consumption. Both sides of the cholesterol need some attention, exercise will help as will diet. I need to start taking a vitamin D supplement, but this is very normal in Ohio. Plus, I need to go get an x-ray on my knee to make sure everything is ok.
Then, after getting the results, my doctor asked me to take a couple of deep breaths and to relax. Then, he took another blood pressure reading and it was still very high – 158/110. This is way too high and needs attention. When I come back for the x-ray results, we will test again and I may need to go on blood pressure medication for a while. My doctor’s opinion is that the blood pressure is related to weight and stress with a heavy influence from the stress. He even asked whether my “measure everything” approach to getting healthy is helping or hurting on the stress level. I scheduled my follow up appointment, left the office and immediately ordered a smart blood pressure cuff to start monitoring at home.